Also, Shostakovich: Hamlet; Glazunov: Carnaval Overture. 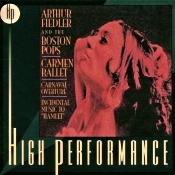 Arthur Fiedler, Boston Pops Orchestra. RCA HP 09026-63308-2. This was the first recording I heard in RCA's "High Performance" audiophile series, which they launched in the late Nineties and subsequently abandoned. Their remastering process involved 24/96 bit technology, using a customized Studer transport with Cello electronics and UV22TM Super CD encoding. It all appeared quite impressive, and I'm sure the results sounded better than much of what the company usually produced. But at the time I questioned their choice of material and never fully appreciated their sonics. 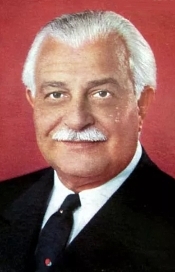 Arthur Fiedler conducted the Bizet and Shostakovich pieces vivaciously, to be sure; Fiedler was a highly underrated conductor by the music critics of his day (and maybe ours today). All they could see was that he led a "pops" orchestra, and many of them doubted he could lead a suitable interpretation of anything more serious than pop material. They were generally wrong. All three works on the disc get crackerjack performances from Fiedler, especially the Carmen Ballet, in Rodion Shchedrin's quirky arrangement of Bizet's music utilizing nothing but strings and forty-seven percussion instruments. Fiedler's realization is filled with all the color, creativity, irreverence, and sly wit Shchedrin no doubt intended. Likewise with the other selections. But it was the sound I was interested in when I listened to my first disc in this series. RCA advertised it as spectacularly wide ranging in dynamics and frequency response. When I listened, I found it in a favorable light, yet not much more so than I did any normally good recording. The sound derived from 1968 and 1969 masters, not an era for which RCA was known for its greatest sonics. The music is quiet in background, smooth, and fairly natural in overall response. However, it is also very much multi-miked and flat in its depth perspective. Frankly, I preferred then and prefer now the sound of RCA's earlier Living Stereo discs, in spite of their occasionally rougher projection and sometimes higher noise level. Nonetheless, for readers interested in the Carmen selection, in particular, one can hardly find a better release.